It's Friday. The sun is shining and I am filled with anticipation for this weekend. We had so much fun last weekend as we were celebrating Canada's 150th Birthday. There were fireworks and visiting friends and of course, yard sales. On Saturday morning we traveled around the area, going from yard sale to garage sale picking up some great treasures. We found a Vintage Glider bike made in England for $20. It was oily and dirty and the tires were wrecked but I was tickled pink. It was smaller than you typically see in this style of bike and at only 5' tall I was the perfect height for it! Luckily the shops were open Sunday and we were able to replace the tubes and the tires which were rotten right through. B greased and repacked the bearings, we adjusted the break lines and the handle bars and I took it for a spin. I rode it around Winnipeg Beach with an extra large grin on my face. Proud to be pedaling this old beauty. 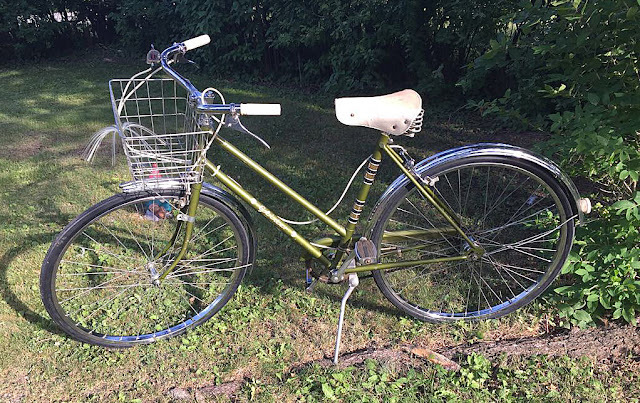 I love vintage things, bicycles and all things green. I am presently working on the two Marinke Slump tribute blankets but after that my fall project will be greens and purples. I will start planning and order my yarn. 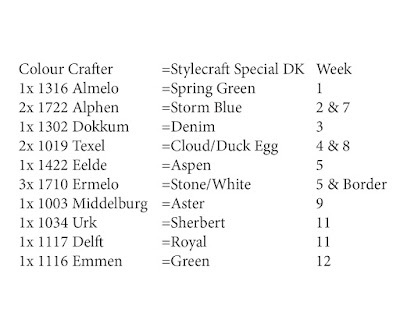 I prefer the Stylecraft Special DK so I will have to order it from Wool Warehouse. Lovely people to deal with. 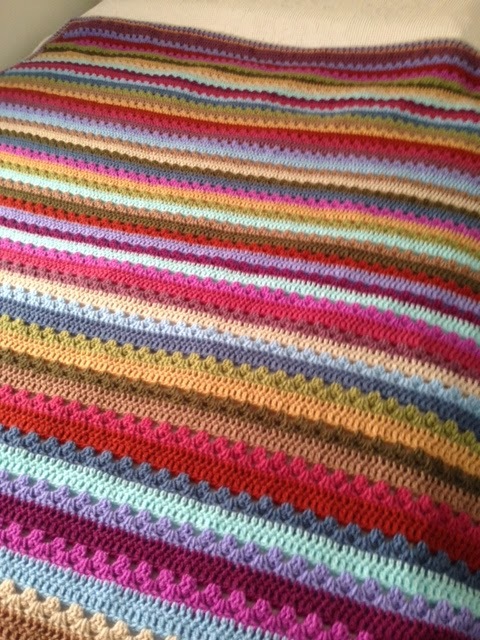 The first Attic 24 blanket I made was the Cosy Stripe. Just look at those colors. I was so enamored with its lovely stripes that I took dozens of photos from every angle and with every background. 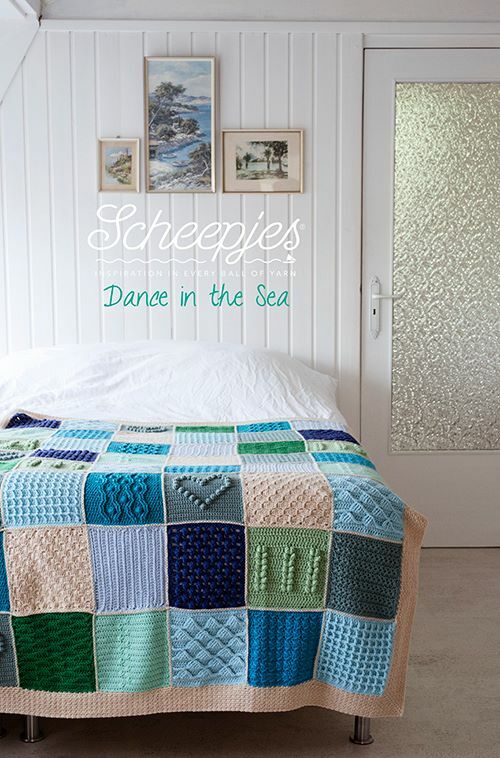 I adore this blanket on the bed at the cottage, it looks so inviting. During the warmer months it is folded up on the chair in the sunroom. Just look at that sweet border! 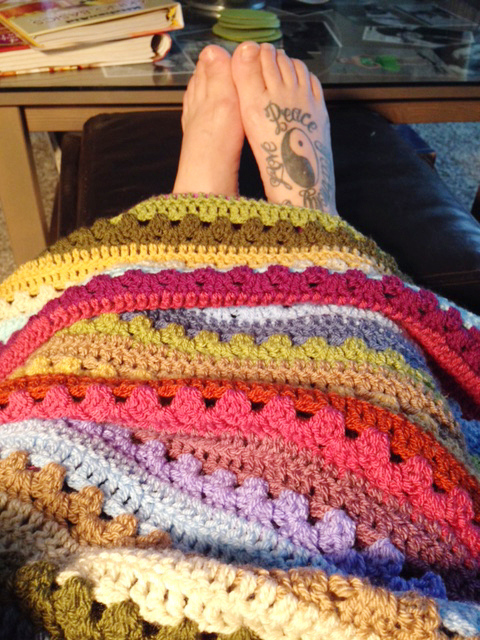 So now this colorful stripey blanket is the star of my blog, it and my divorce tattoo! 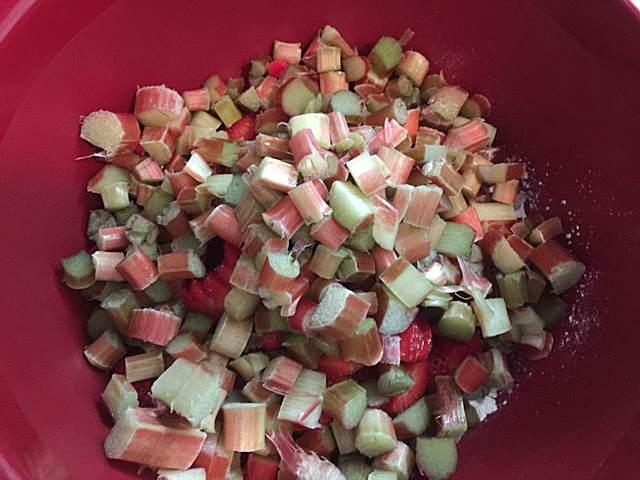 Last week I spent 10 days at the cottage and found myself with an overabundance of ripe Rhubarb. 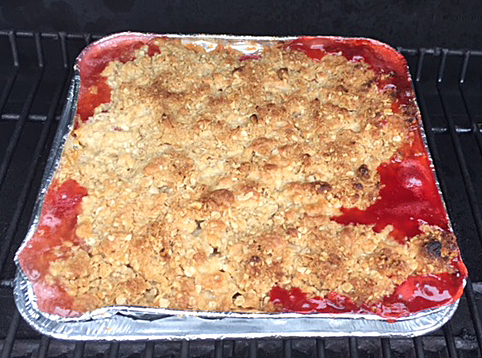 The lusciousness of the red and green colors and the sour taste and smell got me thinking... Rhubarb Crumble. 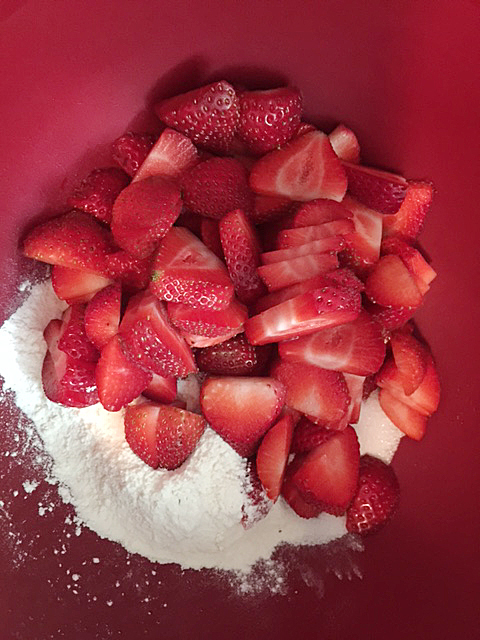 I popped over to the local store and picked up a basket of strawberries and went to working chopping and slicing until everything was ready. Add in the star of the show... the Ruhbarb. This mixture overfilled my little BBQ safe aluminum 9x9 pan. I actually doubled up the pan for added strength and to catch any luscious, sweet drips. Baked at 375° for about 45 minutes. 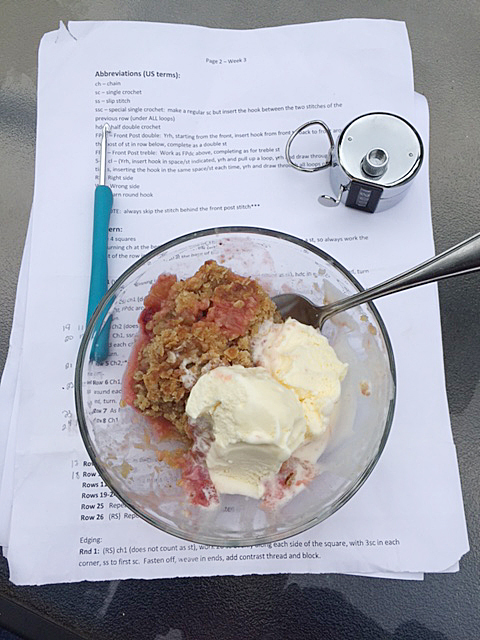 The smell of the Crumble cooking made my mouth water and I was so happy it was going to be okay. Cooking on the BBQ, you just never know. So that day I skipped dinner and had Crumble and Vanilla Ice Cream instead. A concession I was happy to make. The Crumble was so delicious... sweet & sour. 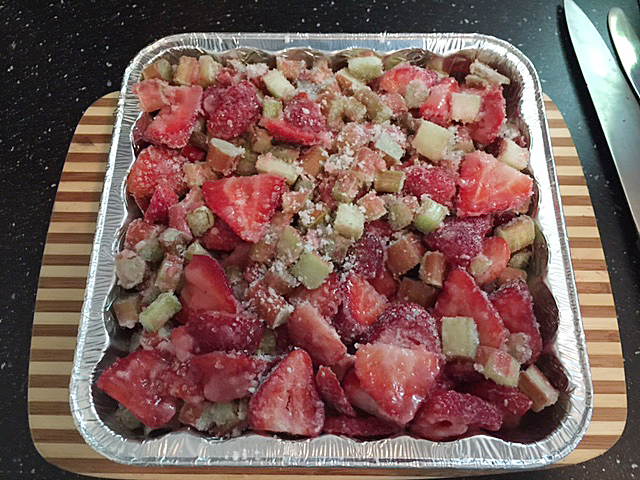 I found the recipe online and will make it again for sure. You should give it a go one day, and enjoy. 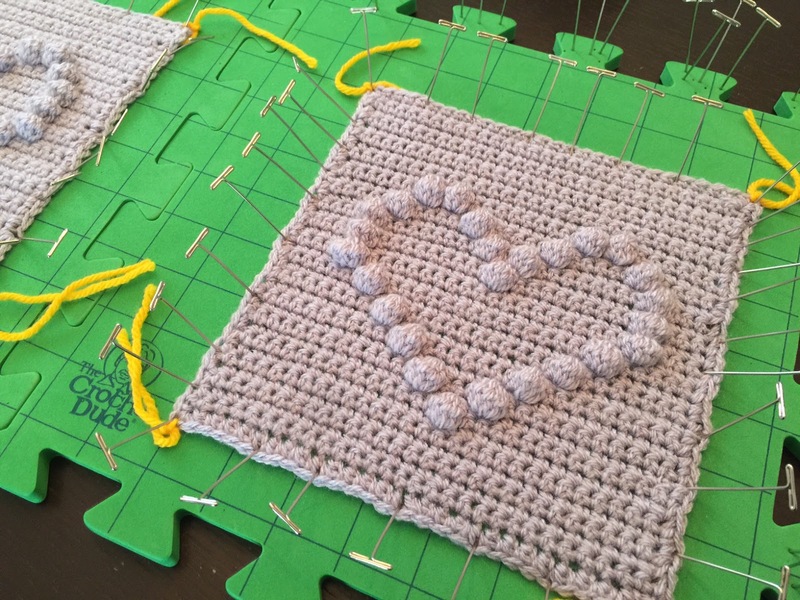 Over the last week or so I have been getting such joy from working on my tribute blankets, block after block. It's very satisfying. Block 2 is completed and beginning block 4 which is a bit more complicated but worth every minute. I know that makes no sense but silly me started the project out of order. 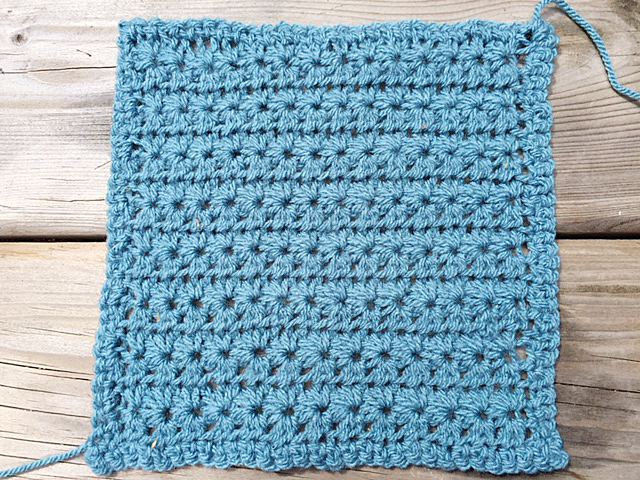 Block 2 is the Star Stitch, which is still my favourite. 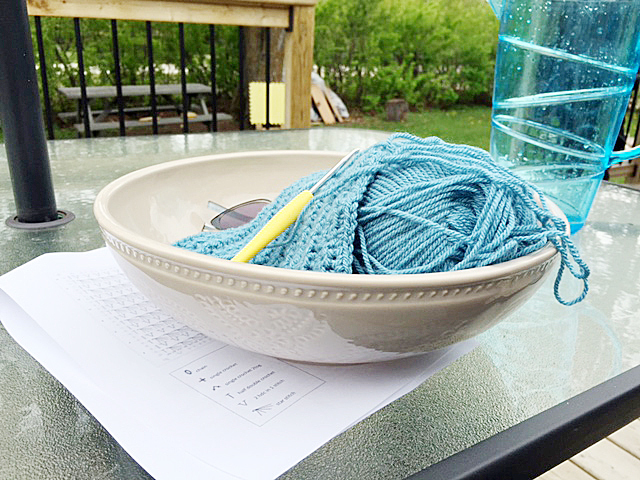 Above is the bowl I use at the cottage to keep all my crochet needs and my reading glasses in one place. I have blocked the first 2 sets of blocks and they look fantastic. 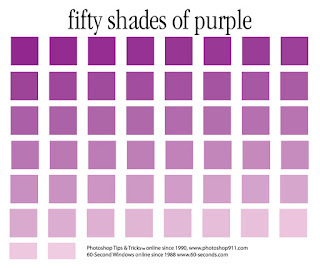 I hope all the squares block this well. I have never wet blocked anything before... until this project. It works! I love that I can stack them allowing airflow without taking up too much room. They were a curling mess but once blocked they come out so perfect it just tickles me pink. It also seems to make them softer which is a lovely treat. I soaked the blocks in warm water for 15 minutes. Placed them one by one on an absorbent towel and rolled them up. Then I gently squeezed the towel to remove any access water. Once I completed this I pinned them to the foam mat using the measurement markings to confirm size. I moved them into a corner where they would not get direct sunshine so as to not discolor the yarn and waited a week... and perfection. On to block 3 and 4, a long way to go... I really have to stay focused to get this done by my made up due date. Yeah I am behind. At the cottage we have these lovely overgrown hedges which provide us with plenty of privacy, flowers and bees. 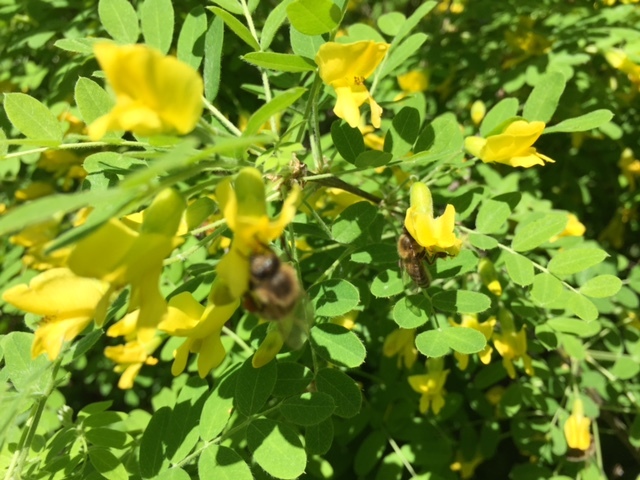 Bees are endangered now so it does me heart good to see them doing so well at our tiny cottage over the hedge. Lilacs and honeysuckle of several varieties. Please share what you are working on with me. I'd love to see it. Let's inspire each other. Labels: blocking, Blocking mat, Crochet, Dance in the Rain, Dance in the Sea, Honey Bees, Honeysuckle, Lilacs, Marinke Slump, Star Stitch, Stylecraft Special DK, Wink, Yarn Bowl. It's been a couple of weeks since my last post as I have been away. Enjoying the cottage and getting plenty done. I'm working on the Marinke Slump tribute blankets. One, while at home and one, while at the cottage. 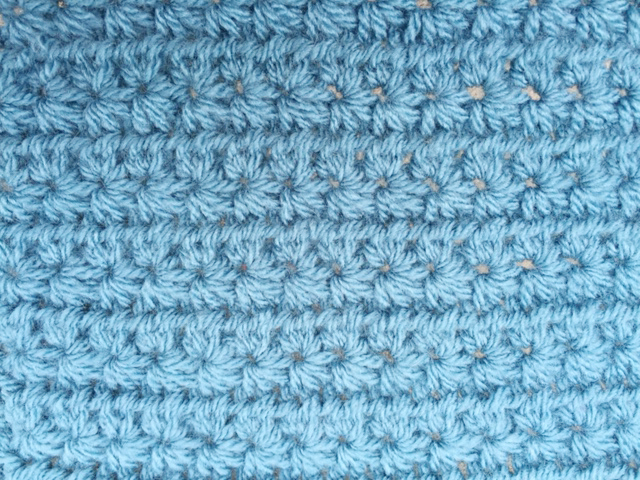 I am only 3 weeks in to this project and have come across my new favourite stitch! I thought I had seen them all but this one... oh I love it. It's easy and works up fast! I did 4-7" blocks in about 3 hours. I will be blocking these and taking pictures later this week. This is a very dense stitch and it uses more yarn that expected but I think it will be a nice heavy blanket stitch and will be using it this fall, for sure! 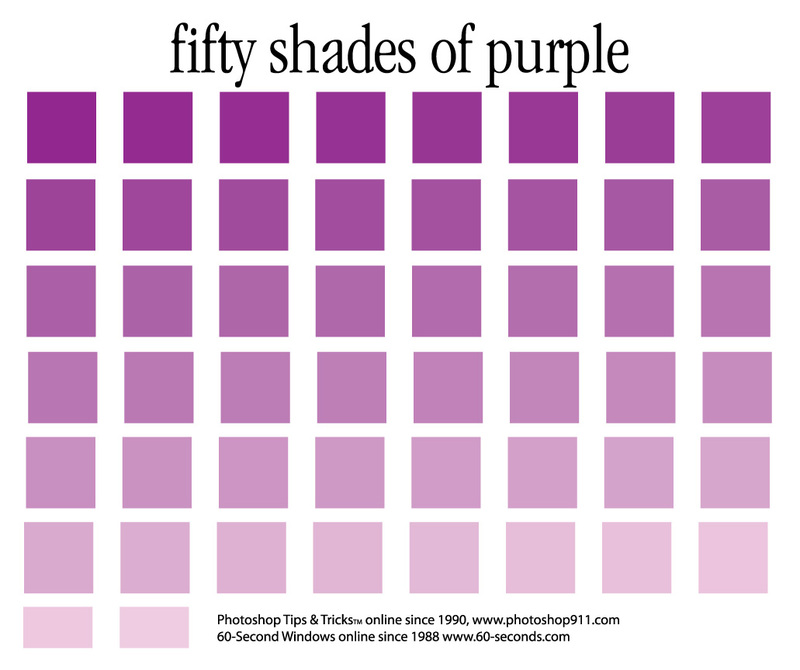 I picture lots of lovely colorful strips, greens and purples of varying values. 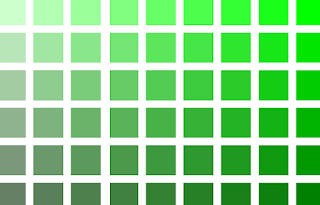 Green is a personal fav. I can't help myself... anything green. 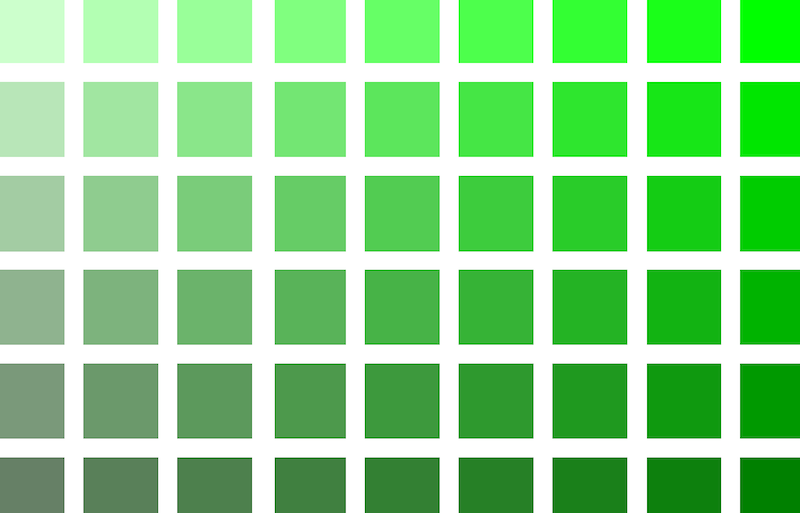 I will lean towards the darker shades of each color and getting excited just imaging the happy rows of my two fav colors interchanged within one blanket. I began work on Week 3 while at the cottage and after 4, yes 4 attempts and rip-outs I have figured out what I was doing wrong. Here is what the block should look like. It's a really nice block, if done right. Haha! Oh my, mine was widening on the left. Only the left. Strangest thing but I figured it out. I was working the WS into the first chain and not skipping as I should. I mis-read the instructions and thought that's what I was supposed to do... I should have known better. So Thursday evening I will have time to tackle this again and hopefully I will get it right. Wish me luck. Time at the cottage is a nice break from city life and the busy streets, the noise and just the overall stress of everyday life. We become more relaxed and take things slower. Even the dog changes his schedule to suit. It's such a nice, quiet time. I don't have an oven in the cottage, by choice, so I have become very creative with cooking on the BBQ. Below is a photo of our new and most delicious pizza to date. 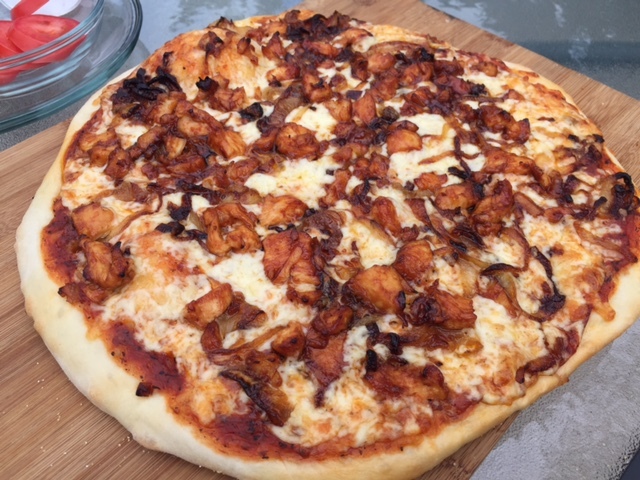 Caramelized onions and BBQ chicken on homemade crust. So many sweet onions. 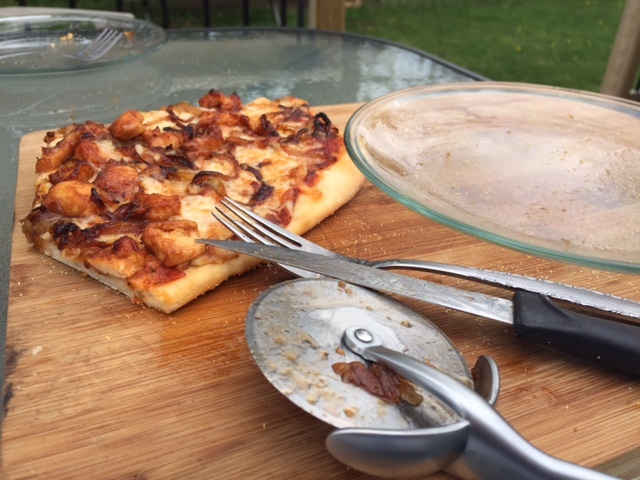 Baked on pizza stone in BBQ for 20 minutes. Thermostat reads about 325° but I wonder how accurate that is. Here is what was left... yum! So that's all for today. Have a lovely week and I will be back with photos of the tribute blankets next week. We are lucky to own this lovely 1920's cottage in a small town located on the shores of Lake Winnipeg. It's a great place to spend summer days and evenings. We sure do miss it come the nasty colder fall/winter weather. 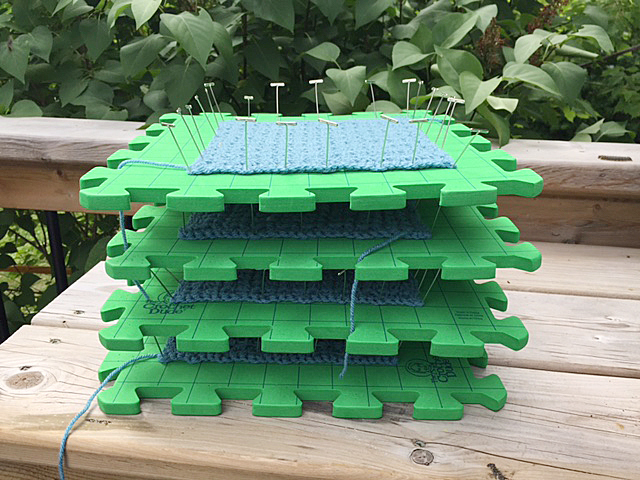 I have spent many hours crocheting at the cottage and working on my stack of handmade blankets that sit in the corner of the sunroom. 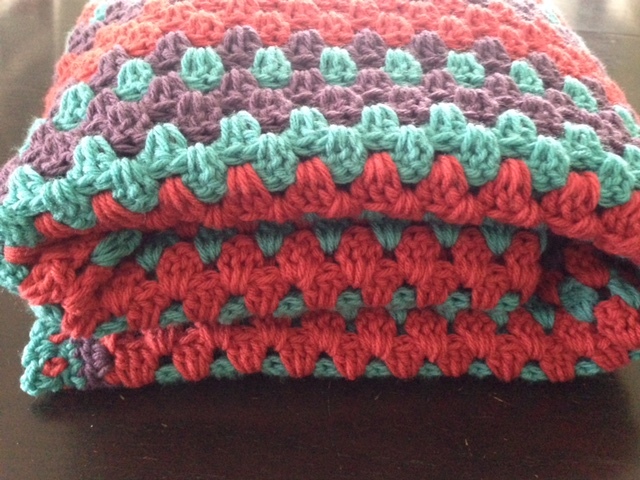 The wavy pattern and colors of this pretty Attic 24 creation have to be my favorite. It's so beachy and colorful. 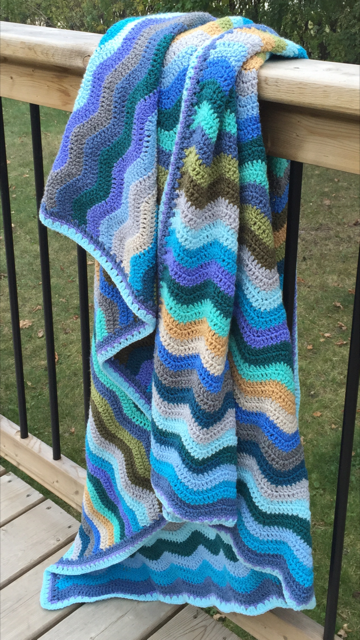 This blanket is call the Coastal Ripple and information can be found here. 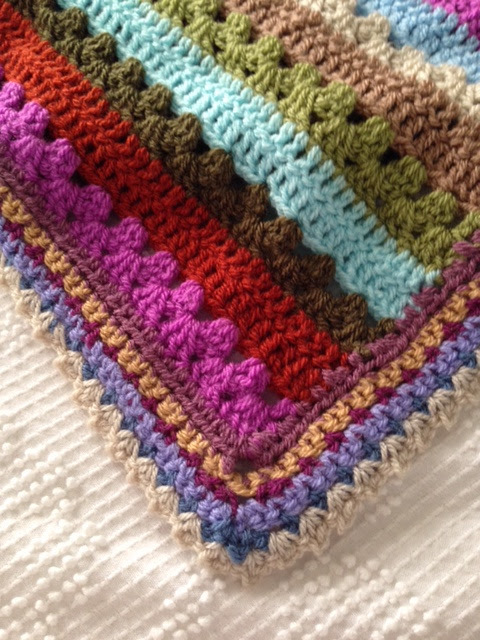 I left the ends wavy when completing the border, I just thought they were so pretty. I love Lucy's patterns. Her sense of color is impeccable. I always wear grey and subdued colors and have shied away from using bright colors in my crochet work but I am having a great time working with all the lovely colors of Stylecraft Special DK. All those colorful, wavy rows make me so happy. Yarn for this blanket can be found here. The prices are great and the shipping is fast and reasonable. They are terrific to deal with and handle any issues quickly and pleasantly. I was reading online this morning and saw a post about someone who was willing to hire someone to weave in her ends. 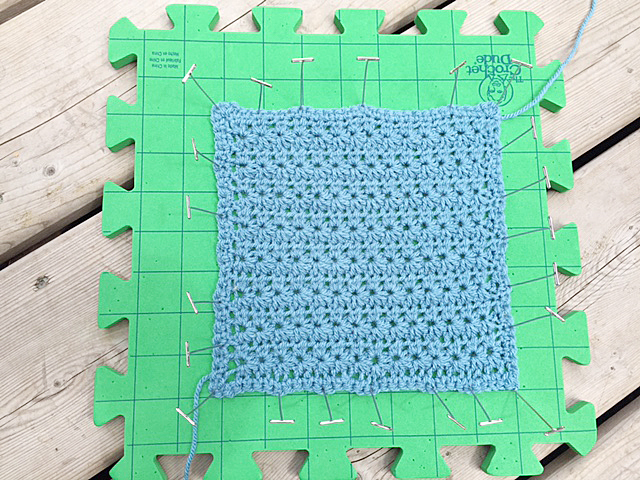 When you doing a stripe, granny square or corner to corner, you know you have a lot of ends. Oiy! Personally I LOVE weaving in the ends. Seeing the finished edges nice and square. 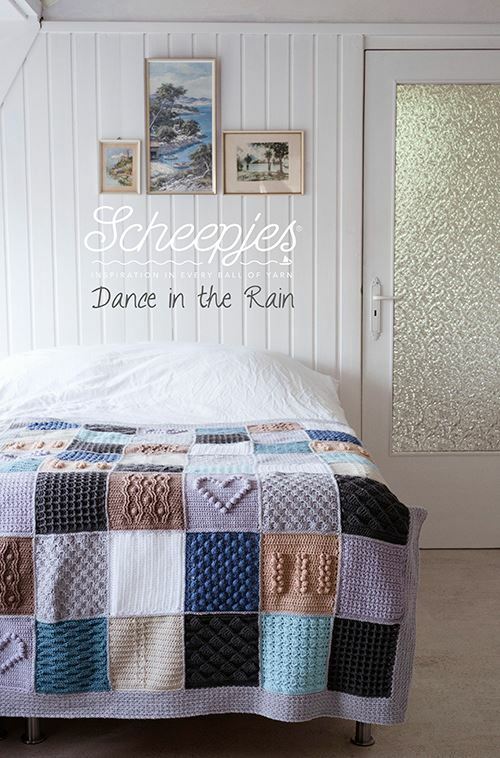 It's a such a feeling of satisfaction and I would be happy to weave in your ends if you want to send me your piece. HAHA! Just beginning another week and already looking forward to heading back to the cottage next weekend. I took Friday off so I can prepare for a special Mother's Day celebration we are having out there on Saturday. A sneak peek at what I am currently working on... my first time Blocking. More to come... have a super week! p.s. please follow along with me on my colorful journey through crochet, sewing and all things creative. Spring/Summer is upon us and it's lovely to feel the heat from the sun as I drive down the road with the window rolled down, hand sticking out. I live smack dab in the center of Canada and winters' here are long and rough. Lots of crochet time through the winter, which is peaceful and relaxing. I went head first into crochet a few years ago although I have been crocheting since my teens. My grandmother taught me how to make a chain as a child but I never went further than that. It wasn't until shopping on my own one day, in downtown Winnipeg that I came across a Learn to Crochet book, bought it, some yarn and a hook and I was on my way. 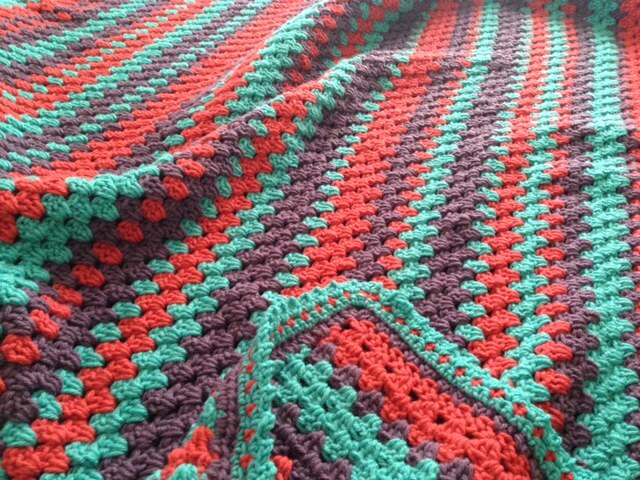 After several smaller projects, ponchos, hats, scarves, etc., I became hooked/addicted to making blankets. This is thanks to Lucy at Attic 24. 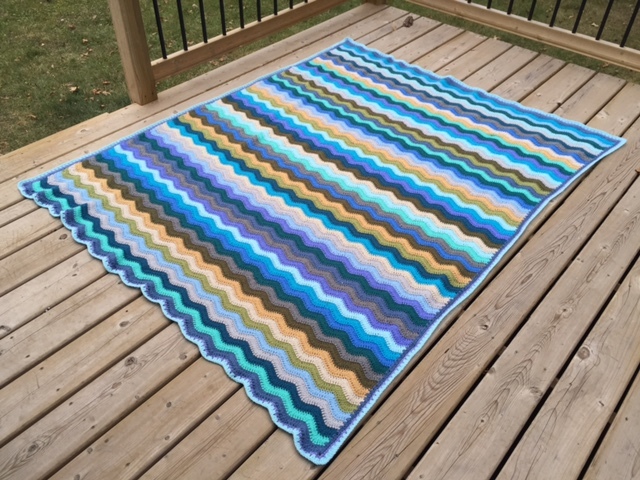 I have recreated several of her lovely blankets, even going as far as to order the yarn from the UK as I can't get Stylecraft here in Winnipeg. Actually our only major supplier of yarn is Micheal's and the selection is sad, unless you are a fan of Vanna yarn, which I am not. 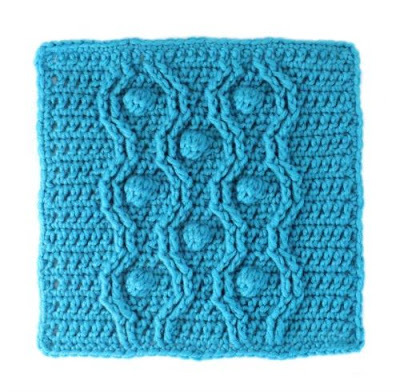 I once spent a year crocheting a granny square blanket in several colors, if memory serves it was about 15 colors. It was so detailed with each square using 4 colors of yarn. What a job. It was lovely and I was so proud until I washed it. It basically fell apart in my dryer and came out a limp dish rag... a huge limp dishrag. I cried and the entire thing went in the trash. That was my first "kill" and blame the yarn as I have washed several other items since and they are fine. In Micheal's defense they do sell a Micheal's brand "Impeccable" that works up very nice but the color selection is minimal. I have become used to the DK yarn from the UK and I guess I'm spoiled now. 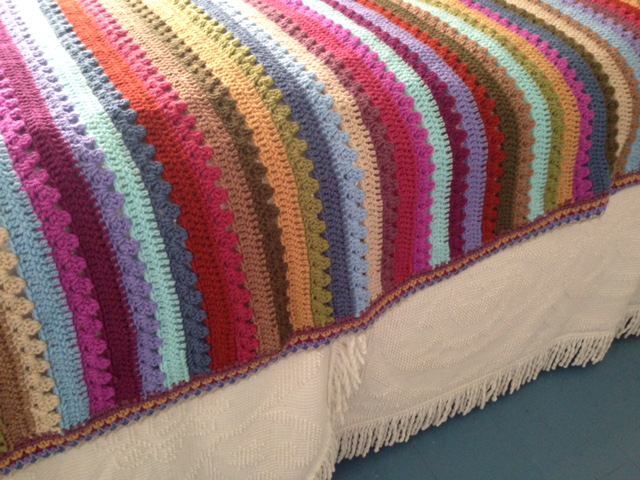 This is a blanket made with the Impeccable yarn available only at Micheals. 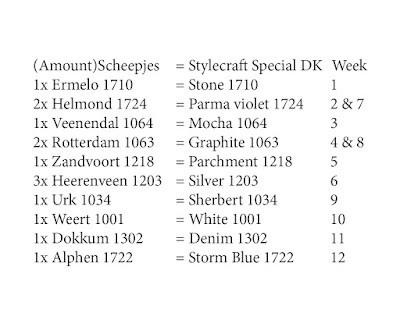 Worsted weight and good price. Washed up nice too. But it's not DK and I love DK. Why is it so hard to get in Canada? 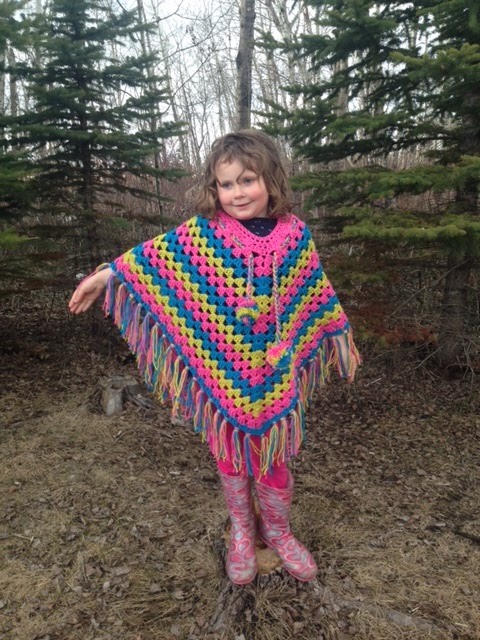 I used the same yarn to make this colorful poncho a few years back. 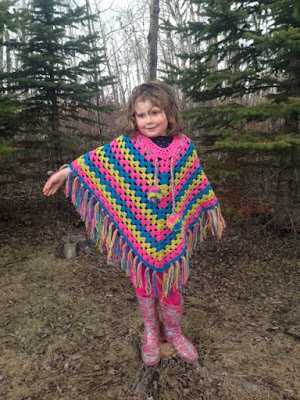 The same poncho was made in two sizes for two different little girls. I do think all little girls should have a poncho... don't you? In the coming weeks I will share some of my past projects as well as my current project where I am making two of the same blanket, at once, using different colors. I am very excited about this summer project. I try wet blocking for the first time with the hopes of not "killing" this next project. I will share that too.